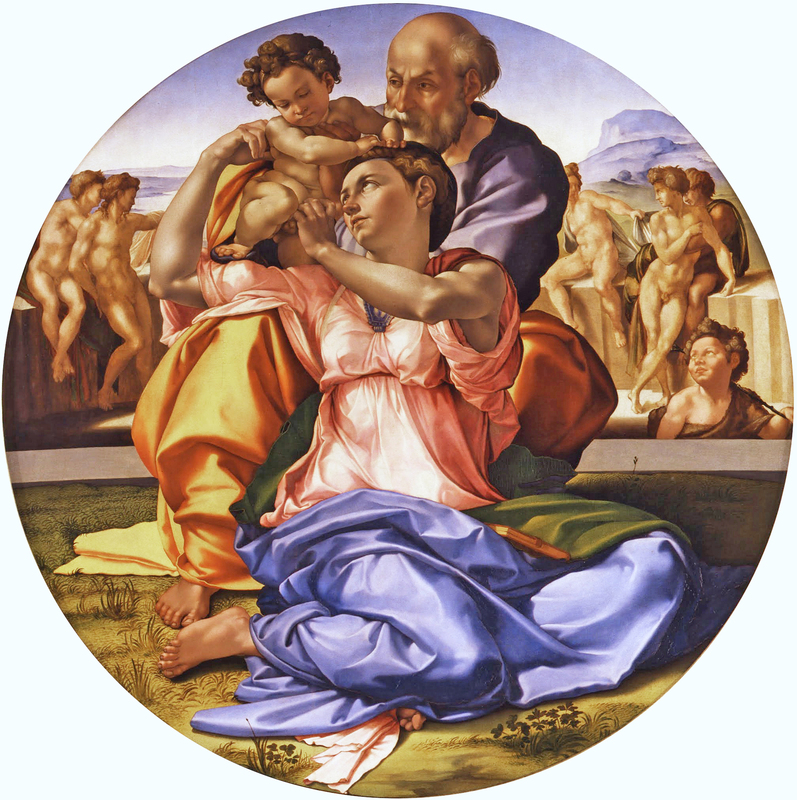 While Michelangelo was carving his giant David for the city of Florence, he was approached by an old neighborhood acquaintance named Angnolo Doni who wanted a holy family from him, only not a marble sculpture, but a painting. It was to be a round piece for an inset on a table. 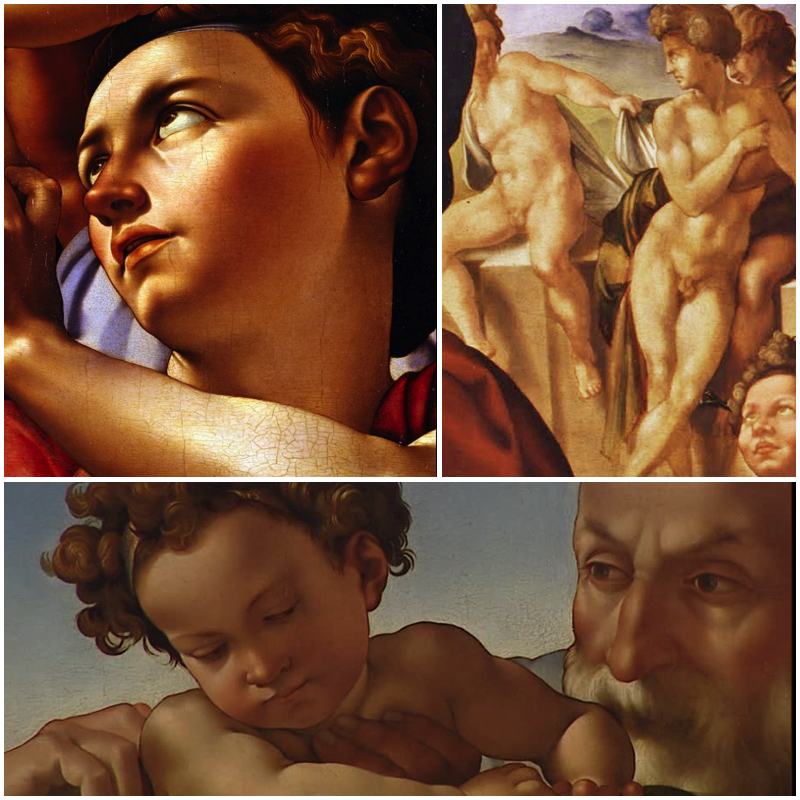 Doni and Michelangelo had played together as boys and as Michelangelo grew to become an artist, Doni became a businessman with a reputation as a sharp bargainer. He was getting married to a prominent woman whose family owned one of Michelangelo’s early sculptures. Doni wanted to give him 30 florins (10 for each figure). At the time a banker made somewhere between 15 to 50 florins a year. Michelangelo balked as he didn’t consider himself a painter (the first of many protestations), but countered with a fee of 100 florins. He wasn’t thrilled with the commission, but the city had given the ok for him to take the it and he had some sketches of holy families in his folio, so he put something together. He made the best of it by adding some nudes in the background and found it an interesting distraction after a long day of marble carving. Word of the contest spread through Florence, with Michelangelo on the short end of the odds as everyone knew Doni’s reputation. However, Doni’s wedding day was quickly approaching and he needed the gift for his wife. Doni showed up with 70 florins, Michelangelo said, “but Doni, you hate the painting, I release you from the contract.” Doni said he’d go to the mayor and force him to fulfill the contract, Michelangelo said he didn’t realize he truly loved the work so he could pay the 140 and it was his. “You agreed to paint the picture for 70!” Doni said. “NEVER!” Doni screamed and left the studio. Michelangelo was about to give in as he’d had his fun when he received a note from an old friend saying that Doni’s fiancee REALLY wanted his painting. He chuckled, sat down and wrote a note to Doni saying that he appreciated how expensive the painting was for an old friend, and he didn’t want him to be embarrassed by the financial hardship, so he released him from the contract and would give the Holy Family to another friend. Doni came running with the 140 florins, Michelangelo handed him the painting with compliments to his wife to be. The whole affair had been a refreshing vacation for Michelangelo.